Stadium of the Year: How much did a stadium cost in 2014? Below you’ll find a brief and very general review of new stadium prices in 2014. But before we start, we should stress that the cost of a stadium is only one of many factors that should be taken into account before judging a stadium. In fact, this is why we’ve waited until late into the Stadium of the Year competition with the below listing, not to suggest anything by the price list. The list leaves no doubt which stadiums had cost the most. Singapore leads the way and not surprisingly. The country has just opened one of the world’s most unique stadiums. 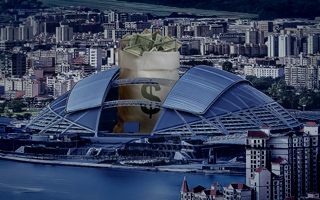 With retractable stands, mobile and illuminated roof, groundbreaking cooling system and the world’s largest self-sustaining dome, the stadium was always expected to be expensive. Especially that the price includes several indoor sporting facilities, shopping center and vast leisure spaces comprising the complex. Levi’s Stadium comes second and that’s also expected as currently the price tag for new NFL stadiums almost always exceeds $1 billion. One might argue that the stadium doesn’t look that expensive and its architecture was subject to some criticism. But it’s the equipment that makes the difference in this case. With new technologies at its heart, the stadium offers more possibilities in matchday experience (or consumer experience if you will) than vast majority of other nominees. Still, the price did raise some skepticism even in the technology-crazy Silicon Valley. Third most distinct stadium in terms of price tag is the most modern Saudi venue. The super-stadium in Jeddah is indeed of very high standard and the complex covers vast space, but the price was also influenced by record-setting construction time. A stadium of 60,000+ was built almost entirely in 14 months, while usually it takes 2-3 times more. Following positions fall into the ‘average’ price if we take into account that Arena Corinthians required nearly 20,000 temporary seats for the World Cup, while Incheon’s newest multi-use stadium also had an immense sports/leisure complex included in its price. The national programs of building new stadiums in Chile, Hungary and Turkey were already subject to some praise here at StadiumDB, especially for what’s very visible here: cost-effective and sensible schemes. None of these stadiums is competing to hold the World Cup, but they were built in a (mostly) timely manner, with domestic needs in mind and not without satisfying quality. There are also examples of stadia which came with slightly lower final quality or limited amenities, which influenced their price. It’s the case of Kingspan Stadium (uncovered terraces constitute significant chunk of its capacity) or Estadio Coruco Diaz. It’s certainly original, but also clearly built on a value-for-money basis. What’s very encouraging is that among the cheapest stadiums opened in 2014 there are some very interesting and high-quality designs. This proves that cheap doesn’t have to mean unoriginal, boring or tacky. Arena Lublin, Estadio Kleber Andrade or the Konya Buyuksehir Stadi certainly stand out, while also represent reasonable investment value. Stadiums nominated represent a wide array of sizes, so we should not forget to compare them by price for each seat available for spectators. It should be remembered that pricing changes between varying sizes of stadiums and some of the prices listed below are increased (for example by including surrounding facilities in the cost) or lowered (some were built from scratch, others thoroughly remodelled).